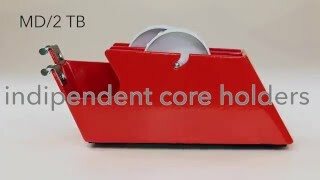 Desk dispensers for adhesive tapes maximum 25 mm. It allows the simultaneous use of multiple adhesive tapes of different colors. The body is made of 4 mm iron layer. Painting is done with powder coatings. Rollers are independent and the object does not contain sand. ID CODE DETAILS € CAD.